Team Team — Ginger writes. My sister Holly invented the name Team Team for our tiny group of people that includes Holly and her husband Dwight, and me and my husband TJ. The team naturally includes all our kids as well. To call ourselves Team Team is to say to one another, “You’re my favorite people, I love you, I like you, and I will do whatever I can to help you." 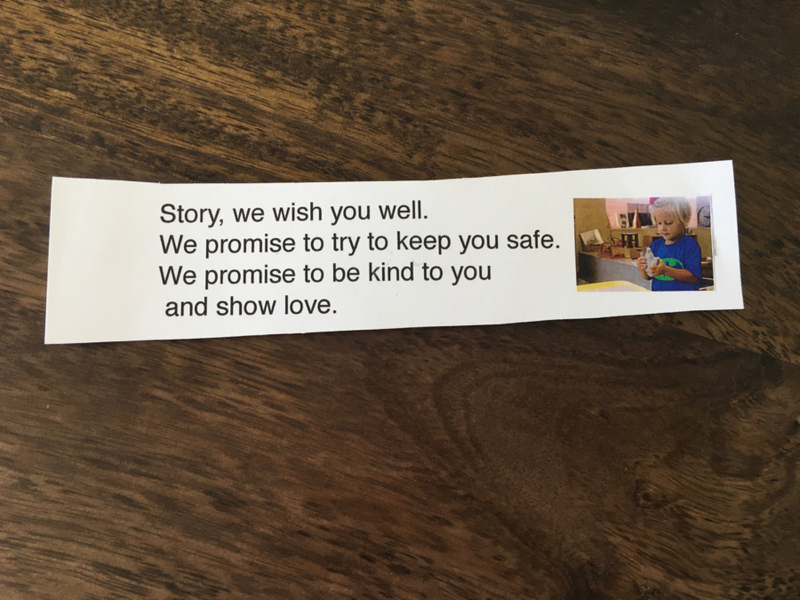 Story, we wish you well today.We promise to try to keep you safe.We promise to be kind to you and show love. Holly, I wish you well today. Dwight, I wish you well today. Hazel, I wish you well today. Wade, I wish you well today. TJ, I wish you well today. Bauer, I wish you well today. Cash, I wish you well today. Story, I wish you well today. Sailor, I wish you well today. I promise to try to keep all of you safe. I promise to be kind to you, and to show love. You are the people God has given me and to whom I have been given. Sometimes I miss doing the very things that speak love the most to the people I love the most. I could write a story about every person on Team Team and tell how I have failed them in some way. Well, perhaps I haven’t failed my nephew Wade who is eight months old. But you know what I mean. One of my favorite movies is called About a Boy, and one of my favorite parts of the movie is near the end when the mom Fiona comes to realize how she has failed her son Marcus. Fiona finally sees what she hasn’t been able to see all along, and in acknowledgement of her error, she admits with a voice of alarm, in an English accent of course, I haven’t been noticing properly. Fiona then rushes to make up for lost time and engagement with her son, and thankfully, it is not too late for redemption. Even in real life, it usually isn’t. Of those on Team Team, TJ is the one I fail most often. I miss opportunities to verbally affirm TJ in his work, especially related to all that he does around the house and yard. You’re so right, Fiona. I haven’t been noticing properly. Sometimes, it’s that I don’t think of encouraging TJ with my words, and sometimes, it’s that if I think of it, I worry that my words will sound cheesy or inauthentic. It’s similar to how I feel when I say the prayer before dinner. I want my words to be full of meaning and heart, but often I think they sound dull and dead. I am talking to God, who is more present in the room than we are,* yet I sound about as enthusiastic as if I were reading my grocery list aloud. I have started telling God in my private times of prayer that I want all my prayers to come from the most real place in me. I want that moment of connection with God at the dinner table to reorient me back to the Realest Real so I can say things I mean and mean things I say. I want to say things I mean, and mean things I say, to TJ as well. We have been in our house for a year now, and we’ve surely gotten in two years’ worth of work in that time, thanks to TJ’s diligence, intelligence, and persistence. He has sweated buckets out in the heat, the past few days especially. I know he is doing the very best he can to hire and communicate with the workers who come around to take a turn being noisy and messy. TJ takes early-morning trips to Lowes and Home Depot, researches best practices and products online, and makes decision after decision after decision. I’m sure I don’t know the half of what my man has worried and worked his way through, until I stop and look around me at the makeover this house and property have received in such a short time. It has been a wonderful transformation, and if this were the Oscars, I would get up on stage and say I owe everything to God first for giving me TJ, and to TJ for giving me almost everything else. I have pretty much just watched from the sidelines, with the kids as my constant sidekicks, or maybe mascots, but I have come to realize that I haven’t been much of a cheering section for Team Team. I’m sorry, TJ. I should just write you a letter if I find it hard to say in person. I don’t know why I should find it hard, except it just seems made up, or forced, or lacking heart. I guess I don’t speak gushing words to anyone, but if I was going to, it should be to you. I should tell you how proud I am that you have taken on so much so soon, and have done it without complaining. You have used your smarts to figure out things you didn’t even know were things to figure out before we moved here. You have called and called and called all those silly workers who never seem to call you back the same day. You have negotiated prices and painstakingly picked out paint colors. 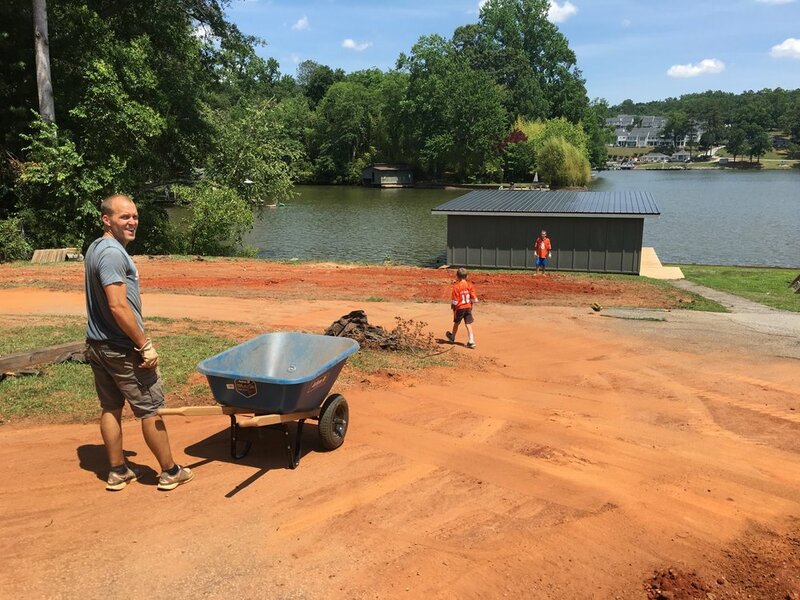 You planted grass seed, taught the kids to water it, built a gagaball pit, built stairs, installed doors, replaced toilets, painted walls, built a retaining wall, moved mulch, tilled ground, laid sod, and the list goes on. TJ, I know you are doing the very best you can, and I haven’t been a good acknowledger of that. I don’t feel like I’ve been negative. It’s just that I haven’t made a point of being positive and affirming. I am grateful for all the decisions you’ve made and I want to encourage and help you as you continue to make more. I know you are always thinking, walking around and looking, dreaming up ways to make things better. I want us to talk about these things and own our house and yard together, just own the things we do and the decisions we make. I am sorry I haven’t been more positive more often, or that I may have made you feel like whatever you were doing wasn’t good enough. It is all good enough and more than good enough. I love our house, I love our yard, I love our lake, and most of all, I love you. TJ, I wish you well today and every day. Go Team Team. *I wish I could take credit for the idea of God being more present in the room than we are. That is a line attributed to Rod Whitacre that I came across recently in Thomas McKenzie's book The Anglican Way. I immediately marked the line and later transcribed it into my Blank Book.